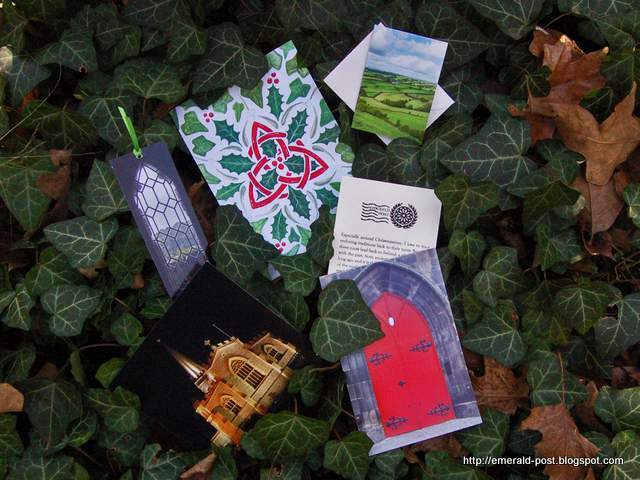 Who wouldn’t love to receive a special packet of handcrafted Irish artwork delivered to your door each and every month? Well, that’s the wonderful monthly surprise offered by Emerald Post. Today I’m delighted to introduce you to this beautiful artwork, and to celebrate St. Patrick, Emerald Post has sponsored a lovely giveaway for one lucky reader to win. 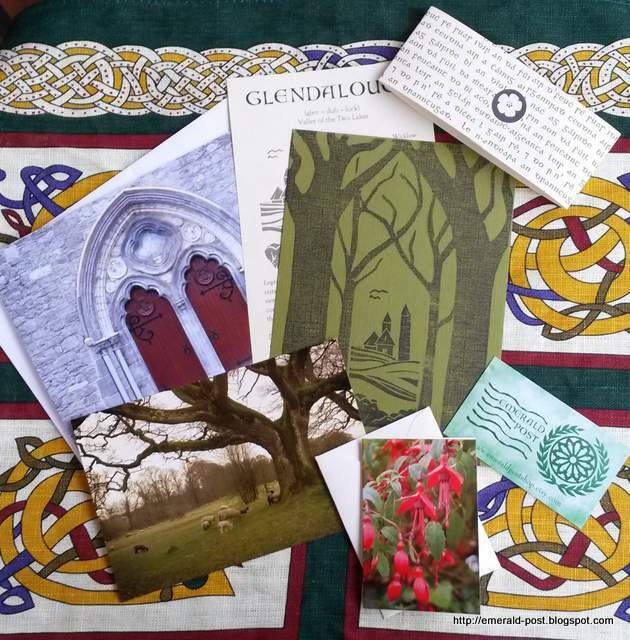 But first let’s learn a little bit about Emerald Post…..
Emerald Post Parcels are magical, old world art bundles delivered to your mailbox monthly. That’s your real mailbox, not the electronic kind. An Emerald Post Parcel is a limited edition bundle of beautiful things sent in a charming, hand addressed emerald green envelope. It is dispatched once a month. Most items are 5 x 7 inches in size or smaller. Your bundle will include 3-5 beautiful pieces chosen from the following categories. Imagine after a hard day’s work, opening your mailbox to find the soft emerald glow of a thick, meaty envelope pulsing with mystery. Imagine sitting down in your favorite armchair or at the patio table, hot cuppa tea in hand to open your Emerald Post Parcel, your name scrawled beautifully across the front. It looks like it has traveled to you from distant lands, from another time. Wonder, magic and beauty unfold and settle in where exhaustion & stress might normally be. 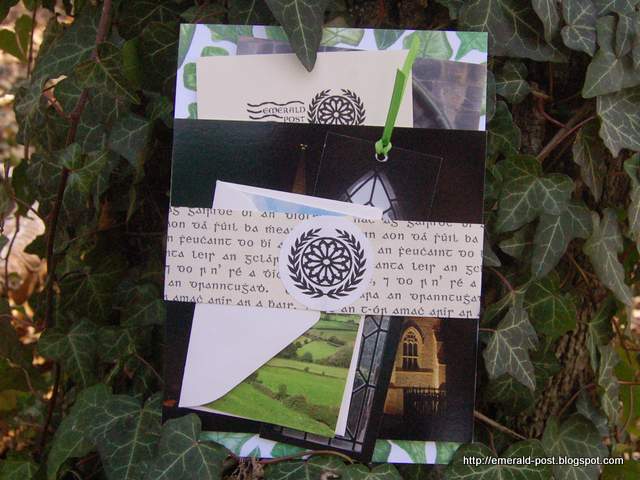 You pull out an artfully crafted bundle inspired by the Celtic lands of Ireland and the British Isles. Today, you find a photograph of crumbling castle ruins covered in ivy, a print of a watercolor painting of ivy leaves with ivy facts and folklore printed on the back, plus a postcard print of a spired cathedral in cloudy blues and greys. Your mind is carried away to green lands, shrouded in mist and myth. 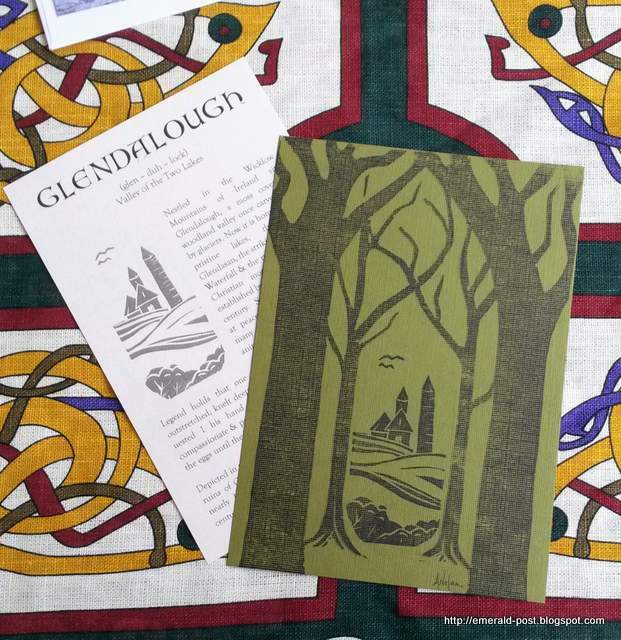 Emerald Post is the brain child of Abby, an artist and traveler based in Missouri who has a deep affinity for Ireland, Celtic history and culture. These passions coupled with her love of simple pleasures, like handwritten letters, inspired Emerald Post. 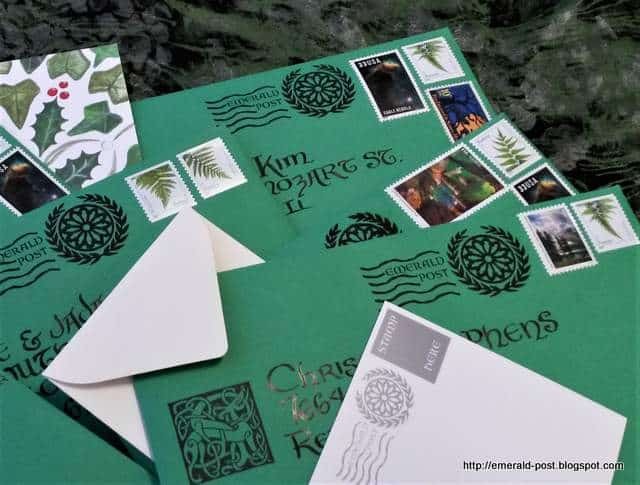 An Emerald Post Parcel is a limited-edition bundle of (mostly flat) beautiful things sent in a charming, hand-addressed emerald green envelope, the old-fashioned way. 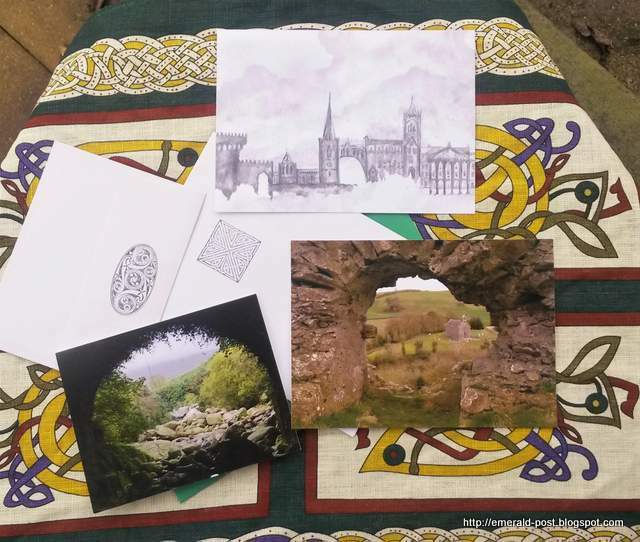 Each Emerald Post may include 3-5 pieces of Celtic inspired artwork in the form of original artwork, art prints, photo prints, notecards, block prints, postcards, etc. 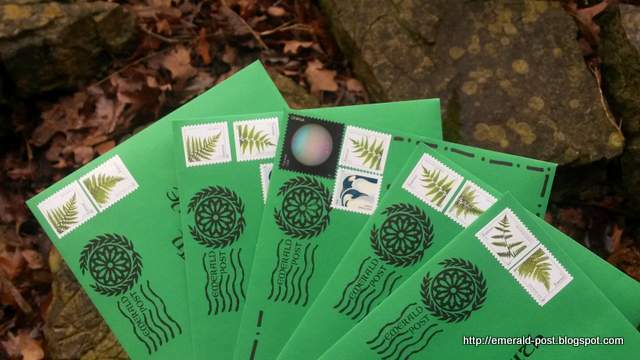 Emerald Post was created to rekindle a love for mail, sending and receiving, as well as to transport subscribers across lands and time to ancient portals, crumbling ruins, mist-cloaked valleys, to a fascinating culture, whose land has lit a spark in the artist’s soul and imagination. The contents of each issue are a secret to be revealed only after the recipients have opened their parcels. You can see contents of past issues on the Emerald Post Blog and you can often find past issues and leftover pieces for sale in the Emerald Post Shop. The March issue will feature Ireland, naturally, as March and St. Patrick’s Day offer us a great time to celebrate Irish culture and history. The March issue will include a fine art print, a postcard photo print, a mini notecard, and large print of a hand-painted map, all of which will pay homage to the beautiful shades of green found on the Emerald Isle. Monthly subscriptions are available at very reasonable prices, and U.S postage is always free. And good news for Irish American Mom readers. One lucky winner will win the March Emerald Post bundle. To enter just leave a comment on this blog post by noon on Wednesday, March 15th, 2017. Any comment will do. 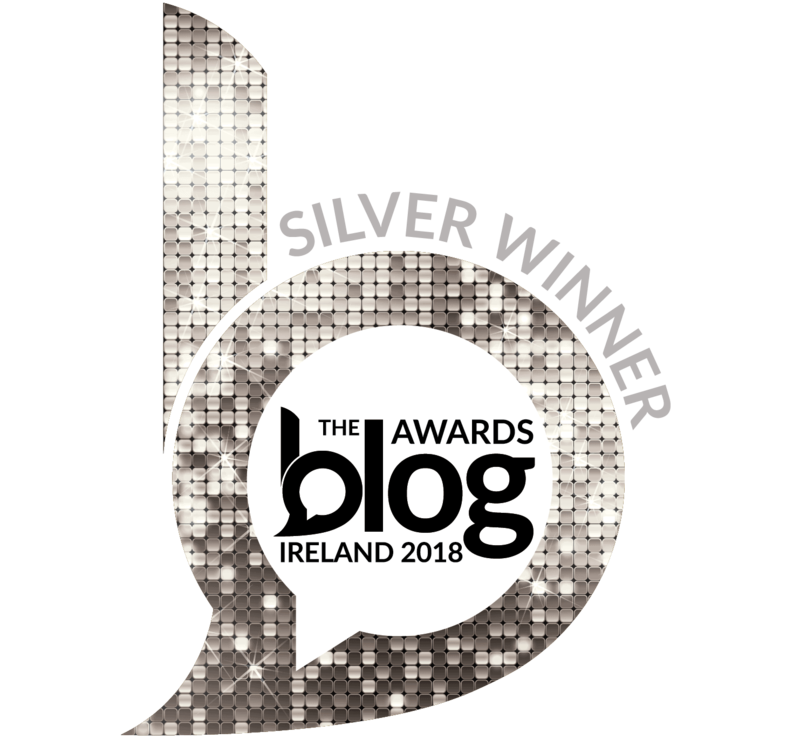 What you write does not affect your chance of winning, but if you need inspiration why not tell us why you think Ireland is such an inspirational place for artists. The winner will be announced on Wednesday, March 15th 2017, at the bottom of this blog post. A big thank you to Abby for sponsoring this prize, and wishing her every success with this wonderful, innovative business, inspired by the beauty of Ireland. And thanks to all who join in the fun and support this St. Patrick’s Day giveaway. Thanks to everyone who joined in and entered this little giveaway. And a big thank you to Abby for sponsoring this prize. Wishing everyone a very happy St. Patrick’s Day. First- thank you for the free email updates. 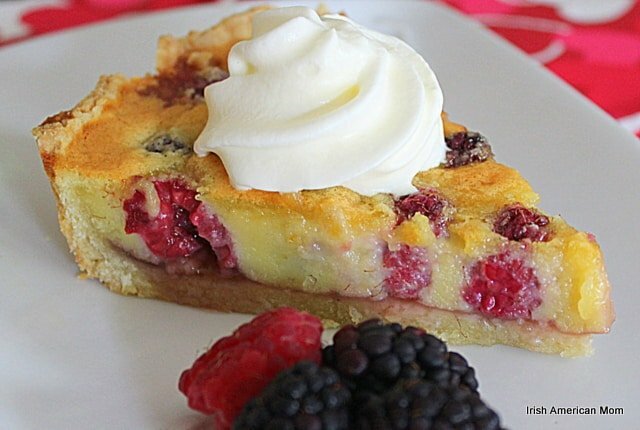 I so enjoy your posts, often saving the recipes and stories. I love these emerald post information. I may put a subscription on my wish list for my next birthday. I do have a question about the Irish Flag cape. This would not be an appropriate use/display of an American flag. Proper flag etiquette would not permit wearing of an American flag where the flag might hit the ground, be stepped on, sat upon and other disrespectful way in use. I didn’t know this until a few years ago when I listened to a woman American Veteran give a talk on flag etiquette. I immediately stopped using a handbag with American Flag print- as it often sat on the floor by my chair. Paper napkins and plates with the American Flag are also not appropriate. “Flag like- but not the flag” is perfectly okay. Since I love Ireland and provide of my Irish heritage, I would respect her flag in the same manner as an American Flag, so that’s why I’m asking about the cape. Thought you might like this information. Thanks again for the regular news and please consider this my comment to be eligible for the giveaways. Hi Tizz – Thanks so much for entering this giveaway. I appreciate your input and tips about the flag, and admire the respect you showed the American flag when you discontinued using your purse with the American flag since you often place it on the floor. Wonderful advice. What a bundle this would be! Beautiful pieces. Happy St. Patrick’s Day to all. I have always wanted to explore my Irish heritage. 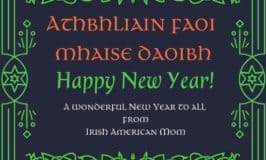 Irish American Mom let’s me do just that. Thanks. We love the time we spend in Ireland, and reminise about our times there when we are in the U.S. Thank you Mairead, these are lovely. I’d love to receive these wonderful little parcels. I do love Ireland 🇮🇪In fact I’m visiting next week! I love the idea of using “real mail”; something you can actually hold in your hand! I would absolutely love to receive this in the mail. Just today we were looking at pics from our trip last summer. Wonderful, beautiful memories! Shopping, prepping,decorating for this year’s annual St Patrick’s dinner. My favorite holiday. Even my Jewish husband has learned numerous irish songs to play on his piano for our sing-a-long after dinner. Wishing you all a happy day. Stay healthy, happy and safe. My daughters birthday is this month (she claims that TRULY makes her an Irish baby LOL) and she’d love to get one of these adorable packets in the mail! thanks for sharing a great company with us! What a fabulous gift idea! Thank you!! Ireland is definitely a place that I want to visit with my little ones when they are old enough. The pictures I have seen (and drooled over with my husband) are simply breathtaking. The glorious green, the rock walls and structures… It looks like such a breath of fresh air. Thanks for the opportunity and like a previous reader posted… This subscription may go on a wish list (for Christmas, most likely). Hi Rachel – I’m so glad you like Abby’s work. I’m delighted to introduce readers to different gift ideas and to help support artists’ businesses like this one. Oh my gosh!!! What a wonderful giveaway! I would absolutely love this! I would love to win this lovely artwork! They are so beautiful!! I would love to receive March’s Emerald Post! As a professional artist, I have always loved the images of Ireland; the rocks, water, hills, sheep flocks, buildings, pubs, sweater patterns, the smiling people. One of my closest friends is from County Cork. She has the most delicious sense of humor. Visiting Ireland is on my bucket list. Having monthly mail, REAL mail one can hold, filled with Irish images is such a wonderful idea. Definitely something I’m going to fit into my budget. This art work looks fantastic! I would love to win it! Many thanks for a heads up about this lovely site Mairead! Planning a trip to your lovely country to celebrate my 40th Wedding Anniversary…what a inspiring way to learn a greater appreciation for my family heritage! Have a wonderful trip, Teresa and happy 40th Wedding Anniversary. Congratulations! This would be an amazing win! What a wonderful giveaway and I am so glad to learn about the Emerald Post! So much green cheer this month, thank you! Another great giveaway keeping Ireland closer to us all. I cannot wait to return; there is so much more I want to see. I just found your blog, love it. And how I do live old fashioned snail mail. Nothing better than a card or letter in the mail. I would love to win this packet of Irish artwork. How fun to get this in the mail. 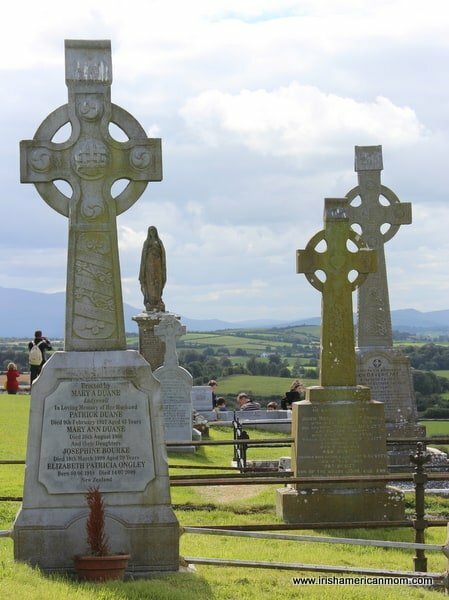 Hopefully I’ll be visit soon & find out more about my Irish heritage, these would be great to decorate with. Thanks for another great giveaway. I think Ireland is such an inspiration because the landscape is stunningly beautiful and it’s rich history is also very interesting. I love receiving snail mail. It would be lovely to get this beautiful artwork in the mail! I would share this with my ten grandchildren. Thank You. What a fun surprise and a great idea. This is so awesome. Will definitely tell my husband that this is at the top of my list for an anniversary gift. We are in the process of planning an Ireland vacation. Loving your blog too. Thank you! Hi Christie – Happy planning for your trip to Ireland. Have a wonderful time. Thanks so much for your kind words about my blog. EVEN A CLOCK THATS STOPPED IS RIGHT TWICE A DAY. I’D SETTLE FOR JUST ONCE! I have always loved the Story of St. Patrick, love the idea of this!! I venture to say there isn’t a one of us who wouldn’t love to receive this package in the mail! Thank you for letting us know about this, Mairead*! And thank you, Abby! And a Happy and Blessed St. Patrick’s Day to all! We were blessed to visit Ireland 16 years ago. Got engaged on St Patrick’s day. 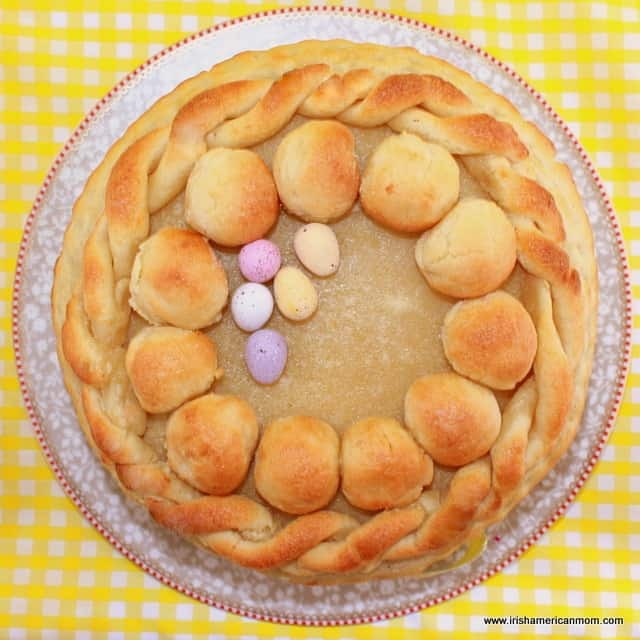 Looking forward to baking and sharing your wonderful Irish Raisin Soda bread and my Irish godmothers favorite recipe for Irish potato candies with friends on Friday. Slainte! Hi Eileen – St. Patrick’s Day was so perfect for an engagement – you’ll always remember the date. Brilliant idea! Beautiful photos/designs! The whole idea warms my heart. Wish I was back in Ireland again, maybe to stay a year. Happy St. Patrick’s Day! Incredibly lovely work. (Thanks for the chance, and also for the percent off deal this month.) As for the question you posed, I imagine artists are capable of feeling and experiencing what exists outside of the five senses– that which can’t be seen but felt in some other soulful way. There is something to fog, like Ireland’s fog, that holds heavy the history, stories, depth of a place. I’ve felt a fog so saturated with meaning, and in it experienced the world around me with what I would call my soul, not my bodily senses. What artist could resist such a fog? Hi Kristy – I love how you talk about the mysticism of fog. When I was a little girl I loved to wake up to find fog in my granny’s farmyard. It seemed to curl and furl across the yard in fat, moving rolls. It felt magical. This would be the most amazing thing to win. I will always try to get to Ireland but until then, this would be amazing! I will thank you in advance! Greetings from Chile! I just found your website while searching for side dish recipes for this Friday’s St. Pat’s dinner, and have enjoyed reading your posts. My husband and I moved to his home country about nine years ago. We had met right before St. Pat’s and it was on that day that he had his first exposure to an Irish-American celebration and family…and was still willing to become part of our clan! He became an O’Nate instead of Oñate that night, and the name has caught on here too! So the day has a heartfelt significance in our lives. Every year, we bring Chilean family and friends together to celebrate here, and I enjoy exposing their palates to many different and new (to them) tastes. The evening is filled with the sounds of Irish music, Chilean humor and the intermingling of Spanish, English and Gaelic. 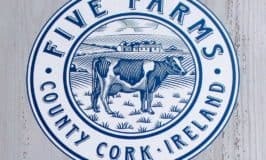 However, as an expat, I am not unique in bringing forward the Irish traditions, for much to my surprise, Chile was a destination for those trying to escape the Great Hunger before the U.S. was willing to open it’s borders to Irish immigrants. One of the national heroes in Chile is an O’Higgins, and we have friends who are descendant from those who sought refuge here. Unfortunately, the traditions were lost here. So, we are doing our part to make St. Pat’s memorable! Hi Eileen – I hope you had a wonderful St. Patrick’s day with all your O’Nate family in Chile. Thanks for letting us know about the connections between Ireland and Chile – a good topic for a blog post. I know there is also a large Irish diaspora in Argentina. Thanks so much for sponsoring this giveaway. Your artwork is magnificent.